ASIC Deputy Chair Peter Kell says that super funds have considerable work to do to raise standards relating to insurance, following a review by the regulator. Though he also noted that some improvements were being introduced by funds. “In the coming months, ASIC will be focused on ensuring that members do not experience adverse outcomes arising from poor complaints handling or inappropriate defaults. It is essential that trustees meet their obligations to deal with consumer complaints about superannuation in a timely manner and provide reasons for decisions as required,” said Mr Kell. ASIC’s Report 591 Insurance in Superannuation found “poor complaints-handling timeframes and practices”. Super funds “must take all reasonable steps to have arrangements to consider and deal with complaints within 90 days. 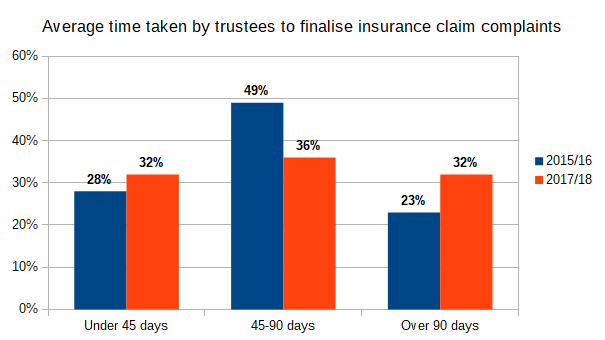 However ASIC found that while more funds were dealing with complaints in under 45 days in 2017/18 compared to 2015/16, almost a third were taking over 90 days, which is worse than the earlier period. Large super funds have been implementing the, criticised, Insurance in Superannuation Voluntary Code of Practice. While ASIC considers that industry codes can raise standards, this “requires broad industry commitment and effective monitoring and enforcement arrangements”. “At present, there are significant weaknesses in the Code, including in its monitoring and enforcement arrangements, that limit its potential effectiveness,” says the ASIC report. ASIC says industry codes work best if they cover the full industry, which can be achieved by making the code mandatory. However ASIC doesn’t have this power. ASIC identified that a “small minority” of super funds trustees were treating members as ‘smokers’ by default when they transferred from an employer plan to a personal plan. ASIC had also raised this issue in mid 2017. ASIC says it will “ensure trustees stop treating members as ‘smokers’ by default”.